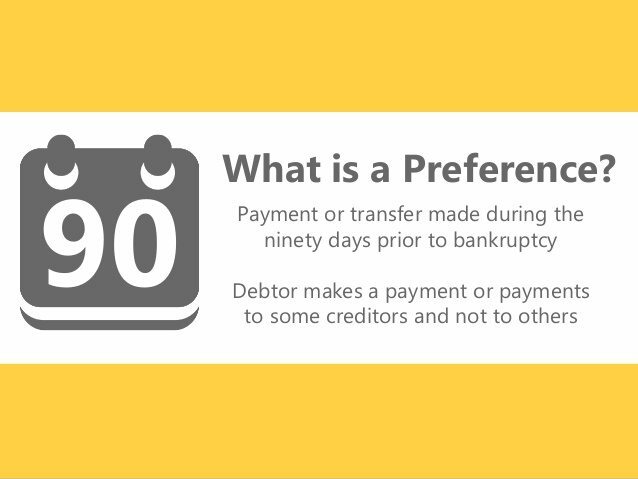 What is a Bankruptcy Preference Claim? In many circumstances, the United States Bankruptcy Code gives the bankruptcy trustee the ability to claw back payments made to creditors outside of the normal course of business during the 90 days prior to the bankruptcy filing (1 year before the filing in the case of insiders). These claims usually come in the form of a letter written by the bankruptcy trustee or their attorney to the creditor some time after the filing of the bankruptcy. You need to anticipate a preference claim if you receive a large payment outside the ordinary course of business in the days or months prior to a bankruptcy. These payments are often made to creditors who have long standing relationships with the debtor. Also, if you request a security interest or a guarantee for pre-existing debt during this period, this security interest is likely a preference. There are defenses to a bankruptcy preference claim. There are basically three defenses to a preference claim: the ordinary course of business defense, the contemporaneous exchange for new goods or services defense and the new value defense. The creditor has the burden to raise these defenses. The ordinary course of business defense requires the creditor to show the payments made to the creditor during the 90 days prior to the bankruptcy filing were made in the ordinary course of business. If the payments during the 90 days prior to bankruptcy were within normal payment terms, this is a complete defense to the preference claim. The court will look at the payments received over the year or two prior to the bankruptcy filing to see if the date from invoice to payment varies during the 90 day period prior to filing. If the time from invoice to payment shortens during the preference period, this may be considered a preference. But if there is no variation, the ordinary course defense will work. Your attorney should review all of your a/r reports for the year or two leading up to the bankruptcy to raise this defense upon receipt of a preference claim letter. As an alternative, the ordinary course of business defense also exists if the creditor proves the payments were made following some type of industry standard. To prove Industry standards, however, an expert must testify about this standard. Thus, this is a harder way to prove the ordinary course of business. The “new value” defense only requires proof that goods or services were provided to the debtor after the payments were made. The value of the newly delivered goods or services will offset the preference payments. The “contemporaneous exchange of goods” defense is just that, goods are exchanged for payment. In this circumstance, if the value of the goods equals the value of the payment, this is a defense to these amounts being clawed back as a preference. Ultimately, as a creditor, if you foresee your customer filing for bankruptcy and they want to make a lump sum payment, you should understand these payments in the months prior to the bankruptcy may be considered a preference. You need to anticipate this money may be clawed back at some point in the future. You need to speak with your attorney about how to handle the situation and the best method to protect yourself. The lawyers of Wetherington Hamilton, P.A. represent creditors in all types in bankruptcy matters filed in the state of Florida. Please feel free to call or email us with any questions at (813) 676-9082 or Info@WHHLaw.com.